David Cameron reckons the expansion of the numbers of the Territorial Army that can be deployed on operations is something to boast about - as opposed to getting defence on the cheap, which might be suspected. "Our plan to increase the trained strength of our Territorial Army from 14,000 to around 40,000 in the next few years is something that all Conservatives can be proud of", quoth he. As it happens, this seems to me a broadly feasible objective. But it has to be done correctly if it is not to be merely a numbers game. 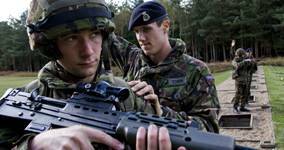 Because here's the basic truth: reservists don't make good 21st century infantry. "Employing Reservists as specialists is a cost-effective way of importing civilian expertise rather than replicating expensive training pipelines." Thus, medics, HGV drivers, helicopter pilots, civil engineers, linguists etc etc can be ideally placed to make tremendous and cost-effective contributions with relatively little purely military training. But not infantry. Why ? Because modern conflict requires that infantry be trained in formation, for manoeuvre warfare. This can't be done at weekends. The Army long ago realised that TA tank units made no sense, and the same is true of infantry. Now folk will rightly laud the performance of TA infantry, deployed in penny packets, in many a recent conflict. So will I: but it doesn't alter the basic point, because they have been taken aside for several months training beforehand: they don't deploy as formed units. It may also fairly be pointed out that 10 Para was a redoubtable outfit (it certainly was: headbangers all, just like their regular counterparts), and that the TA SAS squadrons are frighteningly effective (they are - but they are virtually full-timers, truth be told). But these are not the thousands or more of which Cameron speaks. So - beef up the number of ops-ready specialists, and we'll be well served. Oh - and whatever you do: don't even think of deploying reservists against rioters and strikers in Blighty, as some have suggested. That really would be the beginning of the end. One of my chaps is in Afghanistan. He had his weekends away for a few years. Then the intensive training 8 weeks here I think. Then the 3 months training in Cyprus. All the time this man is on the books and his job remains open. Puts a strain on business. this chap isn't technical so is fairly easily replaced. But it causes the same problems as maternity cover. Short term replacements that need their own training and time to get used to different practices. Replacing someone who may/may not come back. Exactly. and is he infantry ? More disruptive than the necessary hike in taxes to pay for the equivalent reserve of full-timers? ND, great post I like it and I expect you are totally right that some roles are more easily replaced by reservists. Reducing deployments would be the more obvious solution to expenditure. Well trained and well funded full-time troops who aren't used for MP's ego boosts. The fact is that our chaps have now been involved in three wars which are open ended and of no direct benefit to our nation. There is also the issue of what lads are saying at my boy's grammar "Well there aren't many jobs but I could always make something of myself in the Army ..."
Nope. Sorry, lads. You've missed the boat. The generation of school leavers before you will have to do two jobs while you get none. Your dole money and blighted career prospects will not be balanced against the 'savings' that the expanded TA will bring. As with the reduction in police numbers that's another career path denied you. However. You may get work joining security companies specialising in protecting the Baby Boomer generation from being throttled by the offspring they've betrayed. Whether the £5 an hour you'd get protecting them outweighs the pleasure you'd get from throttling them yourself is debatable though.